KickBeat is quite the unique and novel idea on paper, but in execution it's a little half thought out. The concept is a great idea, the initial playthrough is fun, and power-ups add a level of strategy that invites you to try again for higher scores while increasing the game's replay value. While the soundtrack is exciting, and the ability to add in your own songs is cool, the in-the-box soundtrack and dry voice acting makes you want to hit â€˜skipâ€™ sometimes. Plus, the chance to offer something different on a second playthrough was lost. As entertaining as it is, the flaws keep it from being something worth owning at full price, even if it's just ten big ones. All that being said, if you do run into this game on sale, definitely give it a shot. It might just be worth your while. KickBeat is a new take on fighting/rhythm games.Â Itâ€™s like Dance Dance Revolution but for your thumbs.Â As someone with poor foot-eye coordination, KickBeat is a much-welcomed music-based game. Â Its upbeat soundtrack keeps you wanting more, but also wears out quickly making you wish there was content. The story of KickBeat follows the Chosen One, Lee, and his mission to retrieve the “Sphere of Music”.Â The Sphere contains all music that has been or ever will be heard by the world.Â A secret sect of monks protect the sphere but it’s ultimately stolen by a Mr. Halisi who plans to have a monopoly on all the songs in the world.Â Itâ€™s up to you to chase him down and return the music to the people. 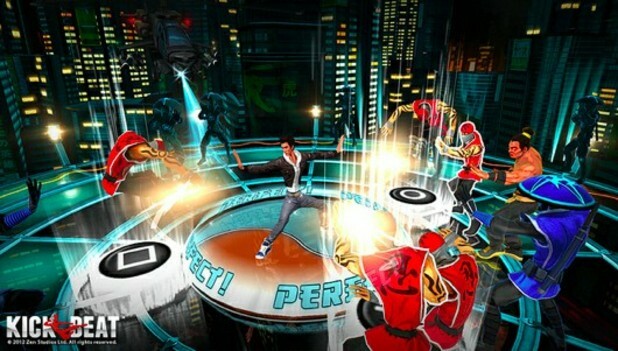 KickBeat has a comic book/cel shaded feel to it.Â The cutscenes that progress the story are a series of slow moving frames.Â During gameplay, the graphics are a lot more refined.Â Originally, Zen Studios used motion capture for the fighting moves, found they weren’t quick enough and ended up hand animating the characters and their attacks.Â Zen Studios did a great job at balancing the animations between natural movements and ludicrous speeds.Â Vibrant colors and strong background detail bring the game’s setting to life and create notable arenas. Â For a handheld console, the PS Vita is an impressive piece of hardware and KickBeat makes full use of it. The sound is the crown jewel to this game.Â As stated earlier, the gameplay is based on the soundtrack.Â The music in this game gets you pumped and ready to take on the world.Â Whenever I paused the game to respond to someone or answer my phone, I felt like I was interrupting an enthusiastic pep talk.Â The soundtrack pulls from the rock genre and is full of adrenaline-inducing songs.Â Some are from underground bands and others from more popular artists like Marilyn Manson. As you listen to a song, you fight enemies who approach you in time with the beat, rhythm and melody.Â Using the four action buttons, you take them out in tune with the songâ€™s aforementioned parts.Â You can use either the D-pad or the action buttons; they perform the same function (you can also use the touch screen, but itâ€™s responsiveness pales in comparison).Â The L and R triggers are used for bonus power ups that can increase your score or release a power attack/shield to help you get back on your feet if youâ€™re feeling overwhelmed.Â This is probably my favorite ability.Â As you get into the higher difficulties, the enemies stop following a pattern and are randomized, and to help you, the power ups allow you to clear the stage for a second and get back into the swing of things. These tiny additions change the game because now youâ€™re strategizing when to use your chi (multiplier) to get the most points. And strategizing will definitely help you in determining if you really need to use a shield or power attack when your health is low. Â These are the kind of attributes that make KickBeat not only a rhythm game, but a fighting game as well. An amazing feature that KickBeat sports is the ability to add your own music.Â The music stored on your Vita can be pulled up in the game, which then asks that you either enter the beats per minute, or it helps calculate them with your aid.Â This allows you to play a level to the beat of your own music!Â This feature isnâ€™t perfect but still warrants recognition as it allows you to beat up ninjas to your own soundtrack. The game can be completed in about an hour or so, at which point youâ€™ll finish the story of Lee and be rewarded with the story of Mei.Â Unfortunately, Meiâ€™s story is to follow Leeâ€™s path.Â Thus, just as you are getting excited for a whole new story you find out itâ€™s the exact same tread through the story mode that you just completed minutes ago.Â This was a little disappointing as you discover youâ€™re just playing the game twice.Â This repetition is unnecessary and was a missed opportunity to expand on the game.Â Meiâ€™s part completes the gameâ€™s story mode, but by using the same soundtrack it feels no different than the first go-through. Unfortunately, the soundtrack is the only good sound coming out of the speakers.Â During the cutscenes, the voice acting sounds like a very dry recital of a script.Â Poor inflections and a lack of the dialogue flowing naturally cause the script to lose any momentum it builds up.Â A couple of times I found myself smirking at the written jokes, but not laughing as I would have if the delivery was better.Â At first listen it seems as though the voice acting is supposed to be the way it is for the script, but if you still can’t tell what’s going on after a few cutscenes and your audience is confused, then then you didn’t make it clear. I wonâ€™t take this into account for the score because this could be a personal thing, but the game gets difficult fast.Â In Normal and Hard mode your enemies attack in the same pattern for a given song.Â This allows you to learn the attacks for a song.Â However, at the Expert and Mastery difficulties you’ll find that where enemies attacked you during the melody, they may now attack you on the beat.Â I said I wonâ€™t factor this into my score because Iâ€™m not musically inclined.Â I drop the bass because I canâ€™t carry a beat – not because it’s cool.Â So if youâ€™re able to identify the notes Mumford and Sons plays on the banjo at the same time heâ€™s playing it, then you’re going to have an easy time with Survival Mode, the most difficult â€˜levelâ€™. KickBeat is quite the unique and novel idea on paper, but in execution it’s a little half thought out. The concept is a great idea, the initial playthrough is fun, and power-ups add a level of strategy that invites you to try again for higher scores while increasing the game’s replay value. While the soundtrack is exciting, and the ability to add in your own songs is cool, the in-the-box soundtrack and dry voice acting makes you want to hit â€˜skipâ€™ sometimes. Plus, the chance to offer something different on a second playthrough was lost. As entertaining as it is, the flaws keep it from being something worth owning at full price, even if it’s just ten big ones. All that being said, if you do run into this game on sale, definitely give it a shot. It might just be worth your while. Iruka Umino and Konohamaru Join Naruto Storm Revolution Lineup!